Gloria stepped away from the workforce for more than 10 years to raise her son. She joined Cloudflare as one of their first returnees and has been with them since November 2016. Here’s her story. What type of work did you do before taking a career break? I had more than 10 years of experience mostly working in IT technical support. What type of work are you doing at Cloudflare? I’m working in a similar role on the customer support team as a customer support engineer. We have 24/7, around-the-clock customer service. I work primarily on customer billing support at Cloudflare. It was quite a bit, almost 10 years. The office where I used to work closed and that is when I decided to stay home with my son. Why did you decide to re-enter the workforce? I really missed working and being a part of something. I was ready to go back. I realized my son didn’t need me as much as when he was younger. How long were you actively looking for a job before applying to a Path Forward return-to-work program? What was that experience like? Less than a year, on and off. I can’t say I was doing it on a daily basis. I did have some interviews, but I was being pretty selective. I wanted to change my career path and work in marketing, but all of the companies that called me for the interviews were interested in my technical support experience. I realized I wouldn’t be able to simply go back to the workforce and change my career focus. Based on that, I started to look around and I saw the returnship position at Cloudflare in customer support. I was so happy when I saw that program. I knew about returnships, but only saw them offered on the East Coast. I was so glad they came to the Bay Area and I applied immediately. What has been one of the more challenging parts of returning to work? I was concerned about how my son would feel without me there all the time, but he was fine with it. One day, when I first started working at Cloudflare, he told me, “Mommy, you know, I don’t need you.” I understood that it was his way of telling me that it was ok for me to continue my career. What was it like restarting your career at Cloudflare? I was nervous and wondered how it would go. Cloudflare specializes in internet security, and that technical domain was completely new to me. I didn’t know much about it, but they provided a lot of support in helping me learn that area. It’s so important that the people in your life support you. It makes quite a difference. I got a lot of support from my husband and I still do. What was it like being part of the first cohort of returnees? When I started, the Path Forward program at Cloudflare was new, but all of the employees were very open to the returnship program. They welcomed us with open arms and always were there to lend a helping hand. It was such a pleasant surprise. Although I was an intern, Cloudflare’s co-founder already knew my name on the very first day. You can imagine what an impact that made. It was very exciting to feel like I was part of something. It feels good to be anchored in something and see results. Did anything surprise you about your return to work experience? Technology has changed things. When I used to work in technical support, it was mostly over the phone. Right now it’s done primarily by email and social media. There’s also a different way to approach the customer, not that formal, though you need to be polite. Internally, you do a lot of online chatting to reach out to other departments and coworkers. Everything is going online. I am proud of all that I learned about the internet security world. There’s a lot to know and I’m still learning. What did you find the most helpful about being part of a Path Forward program at your company? I felt like I was coming into my career restart journey with support, and that was so important. It gave me an advantage versus if I were coming into the workforce without the program. With Path Forward there, I felt like I belonged to a team that took care of me, they were in contact with Cloudflare’s human resource team all the time. The group of other returnees allowed us to share our experiences and bond over the process. It was a great support network. 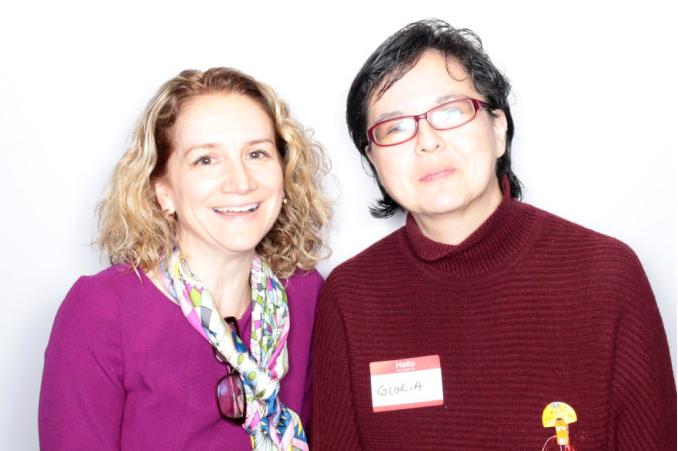 Gloria with Path Forward’s Executive Director Tami Forman at Cloudflare’s International Women’s Day event.